Classic Banksy graffiti badge. 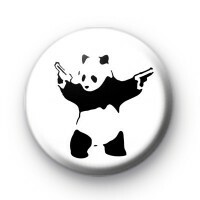 This has one of his most iconic works the black and white Panda with two guns. Banksy is a British graffiti artist and he remains anonymous. His stencilling technique is easily recognisable and his art is usually quite controversial and politically motivated. If you're a fan of his work and graffiti in general then this could be a great badge for you to wear or give as a handmade gift.